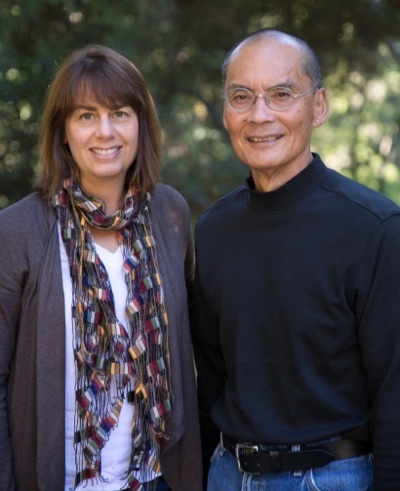 Sociologist Rebecca London and Research Professor Rod Ogawa are helping launch the Silicon Valley Regional Data Trust, which will enable teachers, principals, social workers, public and mental health professionals, judges, and probation officers to share information in real time about students and the services they are receiving. Photo by Carolyn Lagattuta. The answer lies in sharing information among educators and social service agencies, said Ogawa, now a research professor at the University of California, Santa Cruz, and the higher-education leader of a major new data-sharing initiative called the Silicon Valley Regional Data Trust (SVRDT). The data trust will link school districts and offices of education in Santa Cruz, Santa Clara, and San Mateo counties with health and human service agencies in each respective county, enabling teachers, principals, social workers, public and mental health professionals, judges, and probation officers to share information in real time about students and the services they are receiving. The flow of information, coupled with university-based research, will shed light on problems confronting the districts' more than 400,000 children and their families—and point the way to more effective strategies to address their needs. "The thing that was always missing was information," said Ogawa. "This isn't working within organizations to help them improve. This is changing the ground on which they're standing." Teachers and case workers will have access to data "dashboards," updated daily, making real-time information available at their fingertips—as opposed to the current system, in which separate agency "data silos" make it labor-intensive and time consuming for professionals to try to get an accurate, timely picture of how a child is doing. Establishing this coordinated flow of information will be transformational for students, because up to 70 percent of variance in school performance is attributable to non-school factors, including neighborhood, family, housing arrangements, parental employment, language, and health, said Ogawa. The demographics of Silicon Valley mirror national patterns, with some residents enjoying tremendous wealth and opportunity and others mired in poverty. Of the 410,000 students served by schools in the SVRDT, 38 percent receive free or reduced-price lunches, one in four are English learners, and 2,500 are in foster care—all factors linked to significantly lower academic performance, according to Ogawa. "These factors are outside the domain of the school system, but we know they really matter," said Ogawa. "The children who are most at risk for negative outcomes are the kids who live in poverty. They move around a lot. The very kids you can't afford to let fall through the cracks." Ogawa received initial funding for the concept of the data trust from the National Science Foundation in 2013 and additional support from the UC Santa Cruz Office of Research. The project recently received a three-year, $3.2 grant million from the Chan-Zuckerberg Initiative. Ogawa and Rebecca London, an assistant professor of sociology at UC Santa Cruz, are helping launch the SVRDT in partnership with teams of educators and health and human service staff, legal advisers, and engineers. London will oversee the university's research endeavor, which will address "big picture" questions about the practices, programs, and policies of public education and health and human service agencies. "We can study how data are used on the ground to improve services," said London. "We can answer questions posed by our partners and address issues surrounding big data, such as ethical and privacy considerations. It can be the impetus for new policies that improve outcomes for everyone." The Santa Clara County Office of Education will host the data warehouse for education data in the three counties. Each health and human service agency will maintain its own data system. Legal experts are working with each county's legal counsel to determine how to address confidentiality and privacy issues, in compliance with state and federal mandates; each agency will determine what data to share. "We're working from the ground up, talking to people who provide services about what data they need and what data they have to share," said Ogawa. "This project is built on trust." The SVRDT will provide different levels of access to data: Case workers, including designated school staff, will have access to data about individual students; teachers and school administrators will have access to aggregated data dashboards. All stakeholders, from policymakers to parents, will have the opportunity to learn from aggregated reports stemming from UCSC research with the SVRDT. "Collaborating with the community to share research findings is essential," said London. At UC Santa Cruz, Ogawa and London will be joined by an interdisciplinary team of faculty from the social and data sciences, including Doug Bonett, professor psychology; Rob Fairlie, professor of economics; Ron Glass, professor of philosophy of education; Lise Getoor, professor of computer science; Abel Rodriguez, professor of applied math and statistics; and a team of graduate students. "We want to provide graduate students with training in the technical, analytical, and ethical issues related to using big data," said London. "This is a unique opportunity to be involved in community-engaged research with local policymakers and practitioners. This is using big data for social good."